Aspirants can check the ME Jobs 2018 from this page. This article is full of Freshers Jobs for the Master of Engineering freshers who had recently completed their graduation. There are a number of career options for the individuals from various specializations such as Mechanical Engineering, Aerospace Engineering, Chemical Engineering, Environmental Engineering, Electrical Engineering and Electronics Engineering, Engineering Management, Biomedical Engineering and some other. In this page, we are providing the latest ME Jobs 2018 for freshers of various companies with the various apply links. So aspirants who are showing interest to apply can go through each vacancy and apply for the suitable post. Most of the aspirants are choosing the IT Jobs to shine their future. For those candidates, this is the exact place. Refer this page completely and get the specialization wise vacancies in various companies. 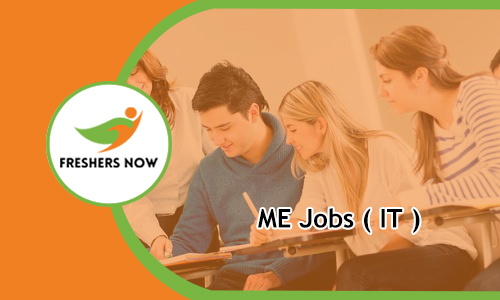 We are presenting the useful information about the ME Jobs 2018 in this article. There are many Job Openings for ME Freshers in MNC (Multinational Companies) as well as Startup companies. Because of unaware of jobs many of the candidates are missing their opportunities in various companies. The IT companies are to help the clients and to resolve some of the critical challenges. Candidates who are having the zeal to work in new technologies and show dedication towards work will definitely have a chance to work in various companies such as Google, Wipro, TCS, Dell, Deloitte, Capgemini, Hewlett Packard (HP), Microsoft, IBM, Citigroup, Oracle etc. Each and every company is seeking for the aspirants who are with good and excellent skills. So candidates undoubtedly can refer this page for the latest ME Job Openings 2018 across India. ME Walkin Drives are also available on our website. Master of Engineering degree is abbreviated as M.E or M.Eng. The ME can be an academic or Professional masters degree in the field of engineering. The candidates have to undergo 2 years of course in any colleges across India or abroad. Most of the individuals will probably like to pursue a Masters in Engineering after doing the Bachelors degree. Each branch in ME will learn some of the skills for the candidates. The Mechanical Engineering programs teach aspirants about how to design and construct mechanical systems. The Electrical Engineering Program helps the aspirants to learn about the electronics, electromagnetism, and electricity. Coming to the Software Engineering program helps the candidates to be specialized in various programming languages. In this manner for each branch, there are special benefits. So candidates of ME can come across the ME Jobs 2018 for freshers as per their specialization. According to the latest reports, there is high demand for the ME Graduates from different specializations. By going through this post the candidates can find the desire ME Jobs 2018 in their dream company. The future for the Master of Engineering candidates will be as stable as possible in any of the IT Company. The ME freshers can get the impressive salary with the additional benefits. So without wasting your time check the Job opportunities for ME graduates from this page and apply as early as possible. As the competition is high the aspirants have to hurry in applying. To be the first one to get the job the candidates have to prepare well for the written test in the selection process. So candidates can check the IT Companies Syllabus and test pattern along with the Placement Papers from our website. Get the data and use it properly. Candidates of Master of Engineering graduates who are willing to start their career in the IT sector can check the vacancies from this page. The ME freshers can apply for Web Developer, Data Analytics, Junior Analyst, Software Tech Support Executive, Software Engineer, Associate Analyst, HR Recruiter, Business Development Executive, SEO/ SNM, QA Testing Manager, Research Engineer, Hardware networking Engineering etc. We have shared the accurate information on this page by collecting from various sources. So the candidates can get the information simply with fewer efforts. Above we have listed all the upcoming and latest ME Jobs 2018 for freshers. For the detailed information about any opening, the aspirants can go through the post by giving a click on the link. Due to high competition for the jobs in these days, the candidates have to hurry for applying ME Jobs 2018. While pursuing the Master of Engineering aspirants have to learn management skills. But due to lack of these skills, a large number of contenders are missing the opportunities in MNC’s and Startup companies. Strong Technical and communication skills are more important for the candidates to get the job in Information Technology (IT) through the Off Campus Drives. Along with this, the aspirants have to cross the interview rounds conducting with the company officials. To easily clear the rounds the aspirants can have a look at the Interview Questions which are available on our website. The primary thing the aspirants have to do is to execute the technical objective skills forth by the company executives to grab the attention. There are both Technical and Non-Technical ME Jobs 2018 for freshers. The candidates can choose it as per their interest. Contenders who had completed and about the Master of Engineering can apply for various job openings by checking from this page. There are many opportunities for the ME Graduates in Government sector also. We are giving a numerous number of job openings for ME freshers. Read this article carefully. For more latest ME Jobs 2018 the aspirants can be in touch with our website freshersnow.com frequently.